We made the choices and you save! 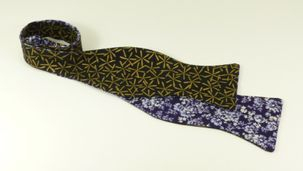 Each Bow Tie is Handmade with Durable and Beautiful Medium Weight Cottons. Care is simple. Spot wash and Iron to Refresh. 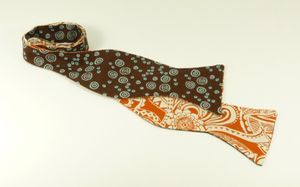 Baby Blue Spirals on Dark Chocolate background paired with Cream Paisley on Orange base. Metallic Gold Stars on Black paired with Silver and White Floral on Navy. 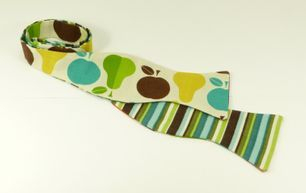 Light Blue, Greens, Yellows and Red Apples and Pears on Cream paired with Blues, Greens, Browns and Cream Stripes. 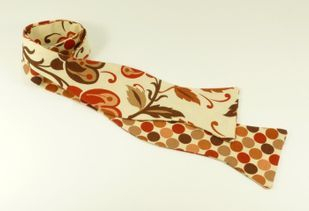 Browns, Tans, and Red Graphic Floral on Cream Base paired with Dots of the same colors on Cream. 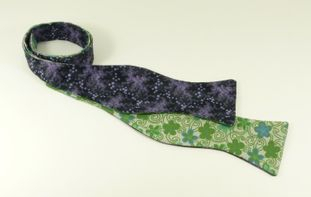 Purple and Black Nebula pattern paired with Green and Blue Flowers on Grey background. 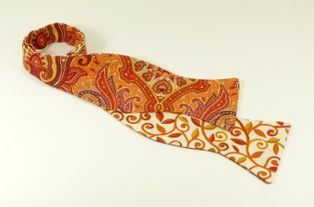 Orange, Yellow, Red Paisley design paired with Orange Vine Scroll on Cream. 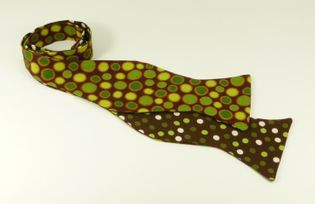 Large Dots of Greens on Browns on one side, and Small Dots of Greens and White on Dark Brown backing on the other.